As you can see, I’ve taken all the opaque finishes off of the powder room walls and moved the toilet into the living area as a commentary on the illusion of privacy in the modern (digital) age. I’ve turned the sink into a piece of functional sculpture, with a wink and a nod to Marcel Duchamp. I’ve removed the bar because I’ll sip no more the devil’s drink, nor will any person in my charge. lol jk, that’s just the demo. I want to re-use as much of the existing framing as possible (which is why the walls are still there), but other than that all of the demo is done. Expect a few more updates on this between now and the expected occupancy date (New Year’s Eve). I’ll try to only post about the renovation when there are interesting things to post about but I make no guarantees. P.S. : Check back soon, I hope to have an exciting announcement later in the week. This entry was posted in Bowman Residence, Features and tagged Demolition, DIY, Home Improvement. Bookmark the permalink. Excellent use of art-speak. Very impressive. 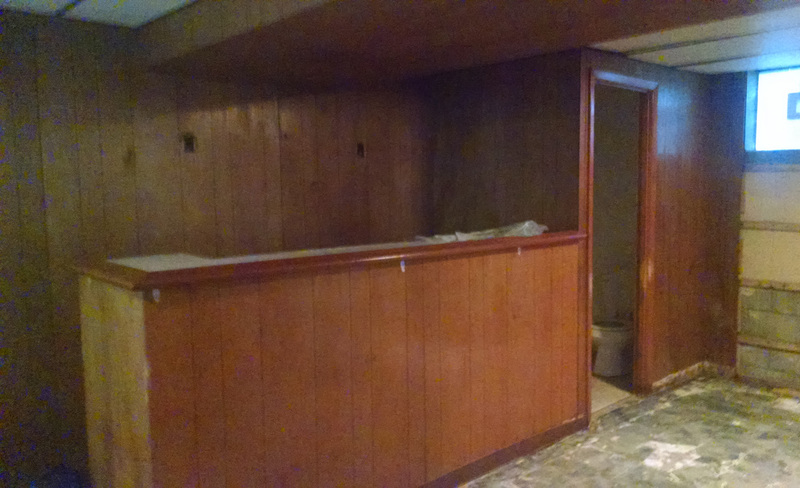 Also hooray for no more wood paneling!